With all manner of Republican lawmakers revoking their endorsements of Donald Trump, it was only a matter of time before somebody asked Tom Brady where he stands after his “good friend” was caught on tape bragging about sexually assaulting women. That time came today at Brady’s weekly press conference. Tom, you have kids of your own. How would you respond if your kids heard Donald Trump’s version of locker room talk? Brady’s response: a bemused smile, a curt goodbye, and a quick scamper away. 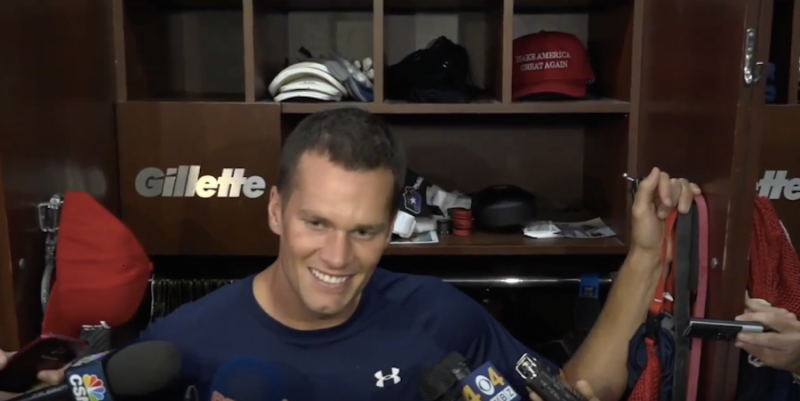 Tom Brady On Donald Trump: "He&apos;s A Good Friend Of Mine ... I Support All My Friends"